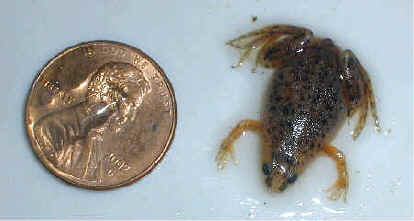 African Dwarf Frogs stay very small. They only will be 1 inch to 1.5 inches long. (from nose to toes). Males and females tend to be the same size and usually the male is just a touch smaller then the female. The average lifespan for African Dwarf Frogs is 5 years. I have not found any research showing that they can live longer. African Dwarf Frogs shed their skin once every 1-2 weeks. First small strands of skin start to hand off their undersides. Then they use their hind legs to kick the skin off of them. In the end, the dwarf frog eats its skin. The whole process takes a few moments and you will rarely get to see it happen. Sometimes the dwarf wont eat his skin or miss a piece of it. 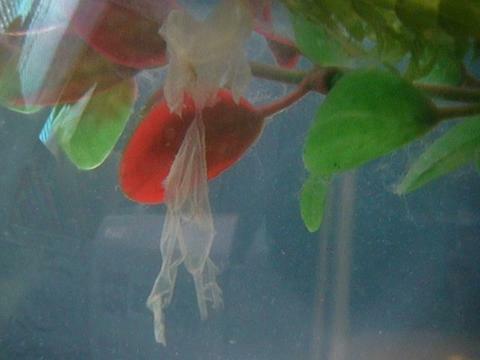 It will be a transparent film hanging on the tank decorations or filter. If you see this remove it from the tank.